Phillip Dutton and Icabad Crane at last year's Aiken Masterclass. Photo by Taggert V Studios. 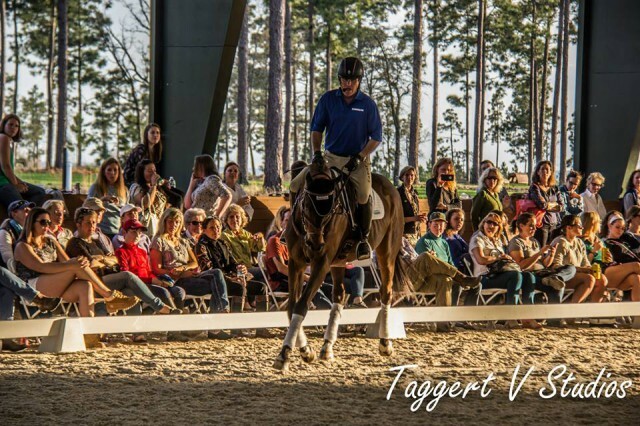 Phillip Dutton and Boyd Martin will bring their popular Masterclass back to Aiken this year with a twist, as the event is also serving as a fundraiser to help support the Land Rover U.S. Olympic Eventing Team’s trip to the 2016 Olympic Games in Rio de Janeiro. 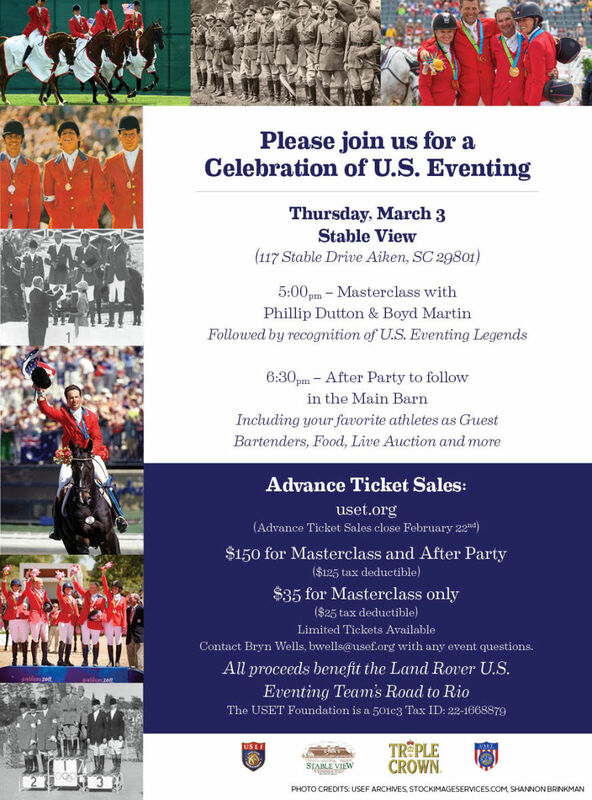 The Celebration of U.S. Eventing will be held March 3 at Stable View Farm in Aiken, with Phillip and Boyd’s Masterclass starting at 5 p.m., including special guest appearances from big names in the sport, like Bobby Costello, David O’Connor, Jan Byyny, Will Coleman, Beth Perkins and Mara DePuy. Then a VIP after party will kick off at 6:30 p.m. in the main barn, with top event riders acting as guest bartenders, as well as a live auction with proceeds benefitting Team USA. More than 350 people attended last year’s Masterclass, and Boyd said he hopes to see an even bigger turnout this year. Phillip said the Masterclass portion of the night will be scaled back to some degree this year since the event is combined with the Team USA fundraiser, but he also emphasized it will still be packed with educational opportunities. Phillip confirmed off-track Thoroughbred superstar Icabad Crane will make an appearance, and both Boyd and Phillip will ride one of their top four-star mounts during the demonstration. Boyd said his broken collarbone is mending well following surgery last week, and he’ll be healed up and ready to ride in the Masterclass. Advance ticket sales close next Monday, Feb. 22, so now is the time to secure your spot for the Celebration of U.S. Eventing. Tickets are $35 for the Masterclass only, $25 of which is tax-deductible. Tickets for both the Masterclass and VIP after party are $150, $125 of which is tax-deductible. Click here to purchase tickets online, and you can direct any questions about the event to Bryn Wells at [email protected]. Stable View Farm is located at 117 Stable Drive, Aiken, SC 28301.